I wasn't around then, and maybe you weren't either, but it's hard to understate the effect that the 1962 trial of kidnapped-&-captured Nazi Adolph Eichmann had on the World's understanding of the Holocaust, of the exceptionally young state of Israel, and of the new reality of how Israel's Jews sought to be understood by the rest of the world. This book really got off on the wrong foot with me, as author Deborah Lipstadt, who achieved some minor fame a half-decade ago for being sued by Holocaust-denying "historian" David Irving for libel, compares her struggle and trial with that of Israel to try and prosecute Eichmann. This goes on for nearly an entire chapter, with a bit of backpeddling (thank god!) - stuff like "Of course I'd never compare what I went through to what the Jews of the twentieth century went through..." before talking about herself at length some more. While I grasped her point, that it is the burden of all of us to not let the Anti-Semite or the denier to gain even a modicum of respect, it was a seriously rocky and ego-inflated start to the book. Thankfully, she's a hell of a writer and a moralizer, and damn me if I didn't come away from this book even more of a "Zionist" than I already am. "THE EICHMANN TRIAL" has a few aims. First, to simply tell the history of the kidnapping of Eichmann by the Israeli secret service in Argentina and his subsequent trial, conviction and execution for crimes against the Jews (as opposed to "crimes against humanity" - a crucial distinction illuminated throughout the book). Second, to give a sense of the conflicting aims of different parties in the courtroom that year, which I'll talk about in a minute. Finally, and most successfully, to illustrate the mindset of Israelis only 17 years after the almost complete destruction of the Jewish race in Europe, and why it was hard for much of the world to come to grips with this & why it was so easy for Israel (then and now) to be angrily dismissive of what the rest of the world thinks - given the history of the Jews under the boot of just about everyone else. I was familiar with only the broad outlines of this story - I "knew" that Eichmann was a baddie and undeniably guilty for his part in the Final Solution, but also knew that there had been a lot of hand-wringing over just how central he was to the Holocaust. The lawyer put in place to prosecute him overreached fairly dramatically, essentially putting Eichmann in place as Hitler's right-hand man ("the two Adolphs"). Not true. Neither, however, was it true that Eichmann was just a mere cog in the machine. I remember growing up whenever my dad would do an impression of a Nazi, he's always say, "But I vas just followink orders" - which was Eichmann's defense, and where that trite expression came from. He was a murderous creep who oversaw the transport of hundreds of thousands of Jews to their deaths or enslavement. Despite the overreaching by the attorneys assigned to close the book on him, it is without doubt that Eichmann lied through his teeth in court about his role and his motives. For Israel, this trial was a national catharsis. David Ben-Gurion, the Israeli premier, successfully sought to influence the trial and make it a referendum not just on Eichmann, but on the Holocaust itself - given the fact that the world at large was riveted by the trial. Therefore, survivor after survivor came forward to give his or her personal story, even if they'd had no idea who Eichmann was. The trial lasted for months, and even though at the end the Israeli judges railed at the prosecution for bringing forth these survivors, doing so ensured the legacy and importance of the trial. The Holocaust had been quietly commemorated in many countries before 1962; but after this trial, it (belatedly, to say the least) exploded onto the world consciousness. The Israelis, personified by an angry Ben-Gurion, are portrayed as being deservedly indignant at much of the world's "outrage" over Eichmann's kidnap and prosecution in Israel, a country not even in existance when the crimes took place (Israel was founded in 1948). What they knew, and what most of the world at that time did not quite grasp, was of the unceasing narrative through history of Jews being hounded from their homes, enslaved, murdered and persecuted in every possible fashion. For these people - and indeed for me and for many others - the phrase "Never Again" was the overriding principle that led to Israel's creation, the hunting of Nazis, the Six-Day War in 1967 and so on. To this very day. I personally look at Israel critics with a skeptical and somewhat hostile eye for many reasons - many of which I captured in this blog post a few years ago - and this book is excellent at illustrating why a methophorical middle finger was extended by Israel to the hand-wringing nations of West and East alike. Finally, there's another chapter in this fairly short book that adds a ton of depth to the historical canon. 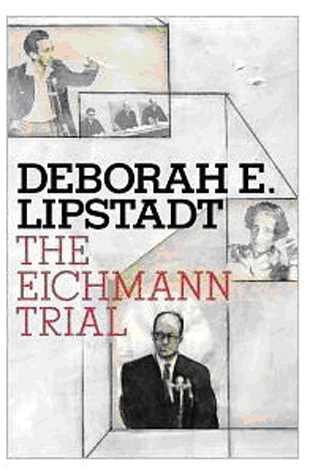 Lipstadt takes on Hannah Arendt's "Eichmann in Jerusalem" and its central place in describing this trial and the circumstances surrounding it. Arendt, the woman who coined the terms "the banality of evil" and gave the world the first clear definition of the word "totalitarianism", is severely taken in task in this chapter for her inability to understand - in her book, as opposed to in her life - the mindset of the Jews prosecuting Eichmann. What initially appears to be a hatchet job in this chapter turns rather abruptly into a defense of Arendt in general, just not for her trial coverage and summation. It's a very fascinating look into the relatively small number of Jewish writers known outside of the insular Jewish world of the time, and how important what they said and how they said it was to the people within that world. I still think Lipstadt, excellent historian that she is, could have done herself a lot of favors by writing a seperate book about her own trial experiences without bringing them up here, but my complaints aside, this book exceeded my expectations and is something I'd recommend especially to you Israel fence-sitters out there.